The head of NATO troops in Afghanistan, Gen. Scott Miller, center left, Kandahar Gov. 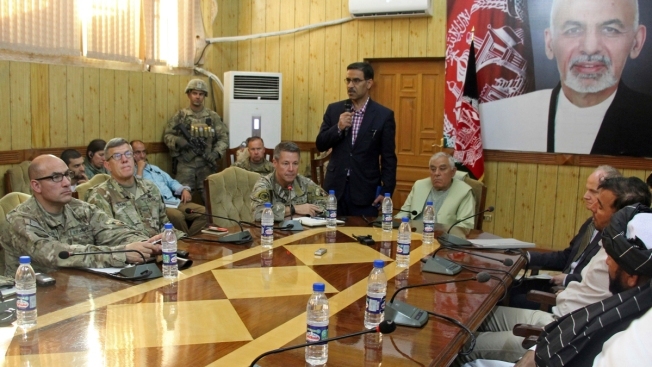 Zalmay Wesa, center right, and their delegations attend a security conference, in Kandahar, Afghanistan, Thursday, Oct. 18, 2018. The three top officials in Afghanistan's Kandahar province were killed, including Wesa, when their own guards opened fire on them at the conference Thursday, the deputy provincial governor said. A Taliban spokesman said the target was Miller, who escaped without injury, according to NATO. The Pentagon has confirmed that U.S. Army Brig. Gen. Jeffrey Smiley was shot in a Taliban attack that killed two Afghan leaders in Kandahar province last week. U.S. military spokesman Cmdr. Grant W. Neeley provided no other details. The Washington Post reported earlier Sunday that Smiley was recovering after suffering at least one gunshot wound while he was inside the Kandahar governor's compound. The Taliban assassinated two top provincial officials Thursday in an attack on a security conference attended by the top U.S. military commander in the country, Gen. Scott Miller. He escaped injury. Smiley was assigned in the summer to lead a Kandahar-based command with a mission to train and advise Afghan security forces and help with counterterrorism operations in southern Afghanistan.